Here in the Philippines the voltage of public electric power supply is 220 Volt AC. Philippine-experienced travelers know that many areas of our beautiful country, including some larger cities like Baguio City or Angeles City may experiences more or less frequent power failures of the public electric power-supply. Some Island resort areas as well as provincial cities may have daily black-outs of up to several hours or half days, other locations may have no power at all except a marginal generator supply for minimal operations. However here at our location in Angeles City we are quiet lucky with the public electric powersupply steadily improving and power failures are getting more and more short and rare. However we at Swiss Chalet understand that you may expect from an Airport Hotel near Clark International Airport and Business Hotel located in the heart of all life and business centers of Angeles City a 24/7 operation. Our valued guests may depend on a smooth continuous 24/7 operation for work or just for a relaxing pleasant comfort. Hence we at Swiss Chalet have invested in a very powerful diesel generator ready to serve you with all power needed for a full operation in case of public power failures to make your work and stay at our Hotel Swiss Chalet a pleasant and efficient venue for all purposes - business or just for fun and pleasure. 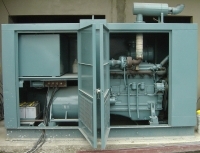 Our very powerful diesel generator keeps all our Hotel appliances and Hotel services as well as full power supply for all hotel rooms like your aircon, TV, fridge with mini-bar, as well as our 3 wireless hotspots working even in cases of power failures. Your comofort above all is our service goal.